As educators, the creation of meaningful literacy experiences for students is a constant work in progress. In order to evolve in our practice, we must continuously reassess the world in which we live, and take note of the ways in which text and images surround children in the 21st century. We look closely at our own daily lives, and the lives of children and families in our spaces and beyond. As we do this, one thing that increasingly stands out is the way in which children notice and mimic the literacy habits of surrounding adults. They are extremely aware of the ways in which adults use multimedia tools to communicate information in the world. From a very early age children are exposed to, and begin to read, images through logos, icons, and avatars. They see communication through texting, messaging apps, and email. Interacting with print has taken on a deeper presence in our lives than perhaps ever before. Therefore, it is our responsibility to offer opportunities to mirror these experiences in the classroom for young children. With this understanding, we need to seek new ways to safely and effectively expose them to letters, words, and images so that they can transfer their understanding of literacy in a way that makes sense in THEIR world. It is with this mindset that Kmail – KID MAIL – was created. As Kindergarten teachers, we wanted to offer children a way to communicate and see the use of letters, words, sentences, and images to transfer thoughts and ideas that is reflective of what they see happening every day. We also knew that as part of this experience we needed to be mindful of embracing the opportunity to help children develop an understanding of HOW to communicate within this form. The rest of this post is about making Kmail yours. You can check out Kmail integration during a shared field trip experience by clicking here. One of the awesome things about having Kmail set up in Google Slides, is that you can create YOUR OWN layouts. This means you do not have to format a slide every single time you want to type a message with your class. Let’s customize your copy together! 1. Grab a copy of the template. 2. Click on View menu and select Master to customize the layouts already provided for you. You will need to click in the text boxes that contain the word “Type” so that you can fill in the names of the school or state kids. Think of how the kids refer to each other’s classes. We refer to each other as California Friends, and New Jersey Friends. We also include tiny images of our school mascots next to our names. 3. Click on the small X in the View Master or click in the light gray slide deck area to close out of the master slides. Check out they layouts you edited and make sure they are to your liking. Before using this with the kids, delete the slides with the Kmail messages, so that you can insert a message slide WITH the kids (steps are below). Be sure to share the slides presentation with your partner class so that they have editing access! After that, you are ready to go. Discussion on writing a Kmail happens within a whole class setting. Together we navigate the subject (used to connect to the main idea of the message), clear and appropriate thoughts and ideas, respectful tone, and application of concepts of print such as punctuation, capitalization, spaces between words, left to right movement, letter/sound correspondence, and high frequency words. All of the conventional literacy experience that we might use within shared writing experience are transferred to this elevated form of modeling communication. 1. 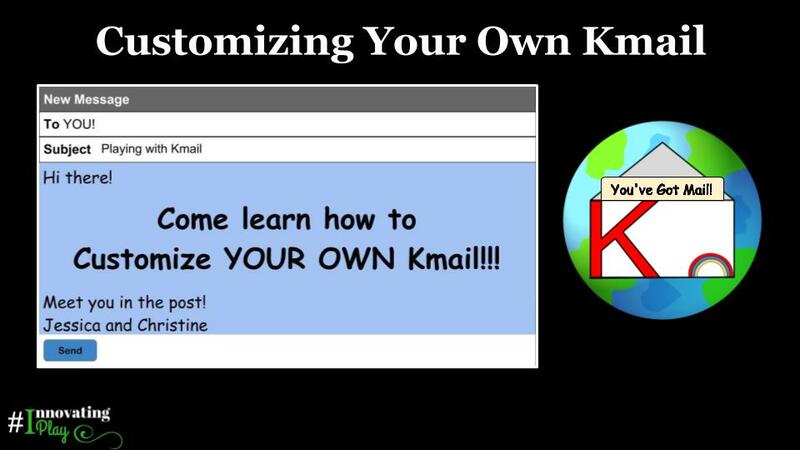 Click on the slide with the dancing Kmail logo, then click on the baby arrow and insert the slide that you have customized for YOUR class to send a message. 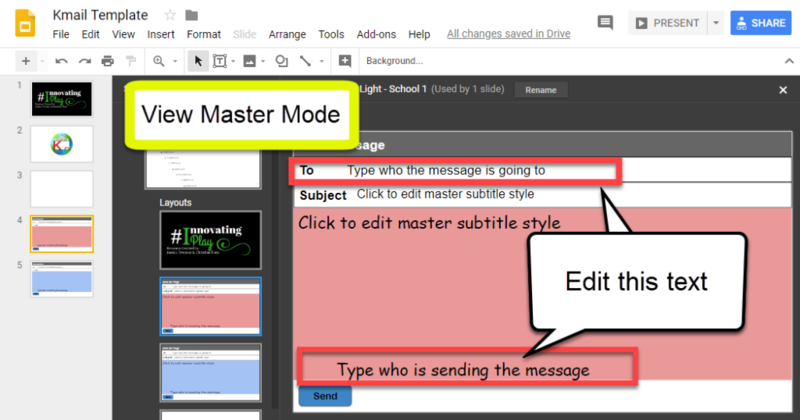 In this step you will edit the Subject and compose the body of the message with your students. Another awesome thing about working in slides is that you can insert images right onto the message! 2. When you are done composing the message with your class, go back to the slide with the dancing Kmail logo, click on it, and copy and paste it ONTO the message with the email your class composed. This let’s the other class know that there is a NEW message waiting for them! One of our biggest challenges as educators is helping children to develop an understanding of what is behind the screen. Within this is the idea that when we put words or images out into a connected world, they are received by people. There is a human connection that needs to be nurtured and fulfilled very early on in order to help children truly develop this understanding. If we wait until they are older and then expose them to email in the adult form, we have lost the opportunity for them to build a foundational understanding about what it means to truly be a digital citizen. Digital citizenship is about empathy and knowing that words and images that shift beyond our fingertips and enter the larger world have meaning and power. The ability to communicate instantly is a privilege that we can use to connect, wonder, play, and discover together. When we hold the hands of young children, and let them learn and feel this by our sides as we navigate between classrooms at a distance, we set the stage for a kinder, more connected, more respectful world. We help to create a world in which people have not just been told to be a digital citizen, but have been nurtured in the mindset of digital citizenship. To help the kids visualize what it “looks” like when a message gets sent, we created a video that captures the composition of a message and WHERE the message is going. Pieces of Kmail and the travel between our schools on Google Earth were images and videos using SnagIt and Camtasia, and strung together in Adobe Spark. This entry was posted in Digital Literacy, Extended Reading, Innovating Play, Kindergarten, Kmail, Template by Christine Pinto. Bookmark the permalink.